Your inner history buff will appreciate Justice & Police Museum and St Thomas Becket Church. Give yourself a bit of retail therapy at Sydney Fish Market and Brett Whiteley Studio. You'll find plenty of places to visit near Sydney: Leura Mall (in Leura), Katoomba Antique Centre (in Katoomba) and Falls Gallery (in Wentworth Falls). 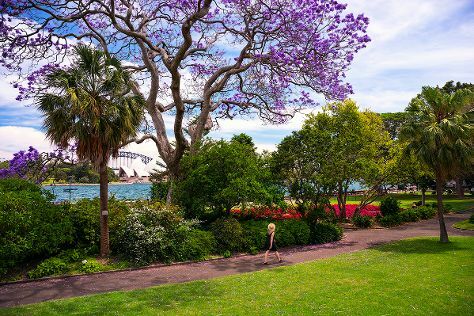 And it doesn't end there: take in nature's colorful creations at Royal Botanic Garden Sydney, examine the collection at Australian National Maritime Museum, snap pictures at Sydney Harbour Bridge, and view the masterpieces at Art Gallery of NSW. If you are flying in from Qatar, the closest major airport is Sydney Kingsford Smith International Airport. Expect a daytime high around 28°C in October, and nighttime lows around 17°C. Wrap up your sightseeing on the 3rd (Sun) to allow time to travel to Eumundi. Eumundi is a small town and locality in the Sunshine Coast hinterland in the Sunshine Coast Region, Queensland, Australia, 21 km south-west of Noosa Heads and 118 km north of the state capital, Brisbane. Your day-by-day itinerary now includes The Real McCaul. Start off your visit on the 4th (Mon): explore and take pictures at The Big Pineapple, then stop by The Real McCaul, and then browse the eclectic array of goods at The Original Eumundi Markets. On the next day, kick back and relax at Marcoola Beach, then step into the grandiose world of Sunshine Castle, and then admire the sheer force of Kondalilla Falls. To find ratings, traveler tips, maps, and more tourist information, refer to the Eumundi online route builder . Traveling by combination of flight and bus from Sydney to Eumundi takes 6 hours. Alternatively, you can do a combination of flight and train; or drive. On the 6th (Wed), wrap the sightseeing up by early afternoon so you can travel back home.